GitLab offers powerful integration with Prometheus for monitoring your apps. Metrics are retrieved from the configured Prometheus server, and then displayed within the GitLab interface. Each project can be configured with its own specific Prometheus server, see the configuration section for more details. If you have a single Prometheus server which monitors all of your infrastructure, you can pre-fill the settings page with a default template. To configure the template, see the Services templates document. Depending on your deployment and where you have located your GitLab server, there are a few options to get started with Prometheus monitoring. If both GitLab and your applications are installed in the same Kubernetes cluster, you can leverage the bundled Prometheus server within GitLab. 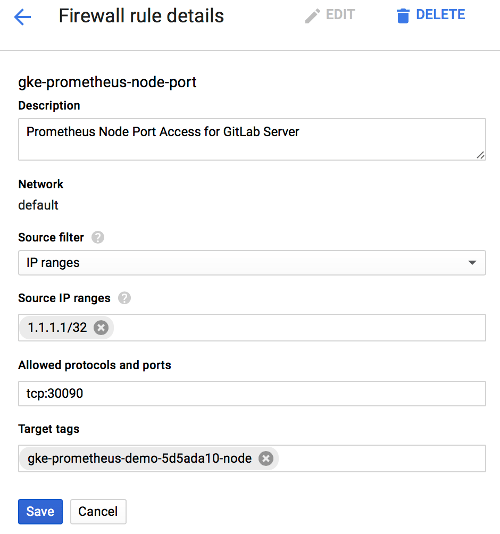 If your applications are deployed on Kubernetes, but GitLab is not in the same cluster, then you can configure a Prometheus server in your Kubernetes cluster. If your applications are not running in Kubernetes, get started with Prometheus. With Omnibus GitLab running inside of Kubernetes, you can leverage the bundled version of Prometheus to collect the supported metrics. 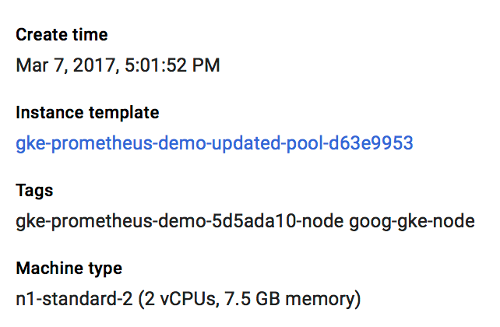 Once enabled, Prometheus will automatically begin monitoring Kubernetes Nodes and any annotated Pods. Read how to configure the bundled Prometheus server in the Administration guide. Now that Prometheus is configured, proceed on configuring the Prometheus project service in GitLab. Setting up and configuring Prometheus within Kubernetes is quick and painless. The Prometheus project provides an official Docker image which we can use as a starting point. To get started quickly, we have provided a sample YML file that can be used as a template. This file will create a prometheus Namespace, Service, Deployment, and ConfigMap in Kubernetes. You can upload this file to the Kubernetes dashboard using + Create at the top right. Once deployed, you should see the Prometheus service, deployment, and pod start within the prometheus namespace. The server will begin to collect metrics from each Kubernetes Node in the cluster, based on the configuration provided in the template. It will also attempt to collect metrics from any Kubernetes Pods that have been annotated for Prometheus. Since GitLab is not running within Kubernetes, the template provides external network access via a NodePort running on 30090. This method allows access to be controlled using provider firewall rules, like within Google Compute Engine. Next on GKE, we need to get the tag of the Node or VM Instance, so we can create an accurate firewall rule. 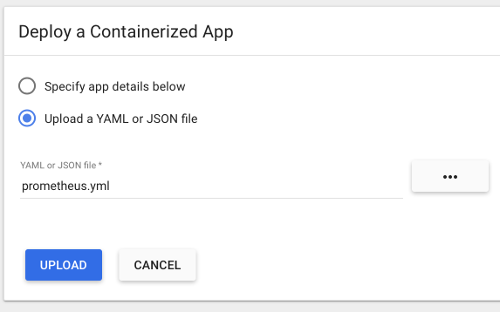 The easiest way to do this is to go into the Google Cloud Platform Compute console and select the VM instance that matches the name of the Node gathered from the step above. In this case, the node tag needed is gke-prometheus-demo-5d5ada10-node. Also make a note of the External IP, which will be the IP address the Prometheus server is reachable on. Armed with the proper Node tag, the firewall rule can now be created specifically for this node. To create the firewall rule, open the Google Cloud Platform Networking console, and select Firewall Rules. Specify the source IP range to match your desired access list, which should include your GitLab server. A sample of GitLab.com's IP address range is available in this issue, but note that GitLab.com's IPs are subject to change without prior notification. Allowed protocol and port should be tcp:30090. The target tags should match the Node tag identified earlier in this step. Now that Prometheus is configured, proceed to configure the Prometheus project service in GitLab. GitLab will automatically scan the Prometheus server for known metrics and attempt to identify the metrics for a particular environment. The supported metrics and scan process is detailed in our Prometheus Metric Library documentation. Learn more about monitoring environments. Developers can view theperformance impact of their changes within the merge request workflow. When a source branch has been deployed to an environment, a sparkline and numeric comparison of the average memory consumption will appear. On the sparkline, a dot indicates when the current changes were deployed, with up to 30 minutes of performance data displayed before and after. The comparison shows the difference between the 30 minute average before and after the deployment. This information is updated after each commit has been deployed.